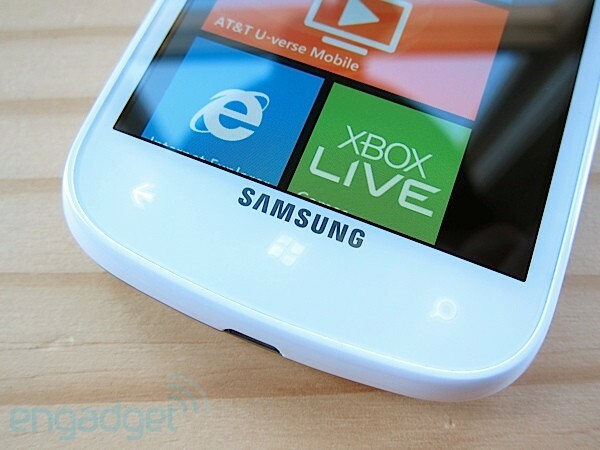 Ready for Samsung's latest entrant to the Windows Phone game? Hopefully you answered "yes," because we're about to take you through an in-depth look at such a device: the Focus 2. Around the time that we United States-based Engadgeteers were lusting over Nokia's Lumia 800 and getting to know the HTC Titan, Samsung introduced its Focus S and lower-tiered Focus Flash WP7.5 handsets. Redmond's hardware restrictions haven't exactly changed much since then, begging the question as to how the Focus 2 fits in as a late follow-up to the original Focus from back in 2010. The bulk of the answer, of course, is LTE. This handset is the only other Windows Phone aside from the Lumia 900 and HTC Titan II to feature such connectivity on Ma Bell's network. That, and it's priced at just $50 dollars on a two-year commitment. Is it a veritable steal like the Focus Flash proved to be, though? Join us past the break where we'll lay it all out. The Focus 2 is a solid little handset, but the Lumia 900 offers more bang for your buck if you can manage the extra $50. Be the first to review the Focus 2? Inside the box you'll find the Focus 2, a USB cable with a cube-shaped wall adapter, an in-ear headset and a pair of information pamphlets. Anyone familiar with T-Mobile's Galaxy Blaze 4G might feel a sense of déjà vu as they glance at the Focus 2 for the first time. The devices are similar in design, but the Focus 2 falls victim to our all-too-common complaint with Sammy-bred phones: it feels just a bit too plasticky. Samsung traded the Blaze's brushed-metal accents and textured battery cover in favor of a literally slick "Gloss Pure White" finish. The overall design ethos remains intact, though, so the device at least feels pleasing in hand. You'll find a 4-inch (WVGA) Super AMOLED display up front with Windows Phone's standard trio of backlit capacitive buttons above the bottom edge. Colors on the screen appear vibrant with gobs of contrast, the black levels are very deep and you'll get fairly good viewing angles. Tilt the device about 150 degrees, however, and you'll start noticing some color shifting. Having the non-Plus variety of Super AMOLED means you're getting PenTile, and it's beyond easily noticeable. Here's the thing: having the non-Plus variety of Super AMOLED means you're getting PenTile, and it's easily noticeable. Once you've seen a display like those belonging to the Focus Flash or even the 4.3-inch Lumia 900, it makes the 800 x 480 resolution look worse than it really is. It's especially obvious on curved borders and text, making what should be a smooth white look like grid paper. We found that it irritated our eyes and was harder to focus on than comparable displays without it. The interesting takeaway is that the Focus 2 has a slightly higher ppi than the Lumia 900 (233 pixels per inch vs. 217). It would be wise to grab a look at this phone in person to see if you can live with it. With that detailed, it's time to move a bit below the display. The capacitive buttons are ultra-responsive like the ones we experienced on the older Focus models, and the device's vibration motor left us with unquestionably better haptic feedback than the Lumia 900. That said, that level of responsiveness becomes a pain in Landscape mode, where we repeatedly found ourselves accidentally exiting out of Netflix into Bing just like with those other Focuses. Another quirk that'll surely annoy some folks is how much the buttons light up -- they're jarring indoors, being brighter than the display on its highest setting. By the way, don't count on the vibration motor to be subtle during a quiet meeting; we noticed it makes a boop pitch that'll easily be amplified if set down on a table. The back of the Focus 2 lays claim to a 5-megapixel sensor, LED flash and speakerphone. 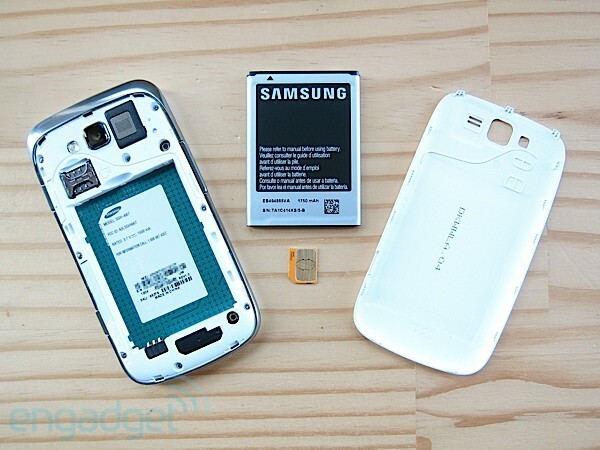 Peeling off the thin, snap-on battery cover reveals a micro-SIM slot and a 1,750mAh battery to keep the handset juiced. 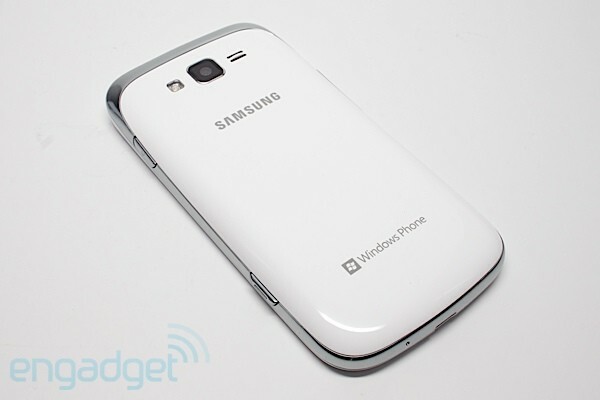 A chunky stripe of chrome plastic wraps around the edges of device breaking up its milky white complexion. On the right, it houses a power button and a two-stage shutter release, along with a volume rocker on the left. All of the buttons have a pleasing click without being too stiff, but they do feel just a little wobbly like we noted on the Lumia 800. The shutter button feels especially great, however, only requiring a light tap to grab a photo without inducing any shake. That leaves us with the top of the device, where there's a 3.5mm headset jack and secondary noise-cancelling microphone, and the bottom which houses the main microphone and micro-USB port. If you caught our initial hands-on, one point that still resonates with us is how small it feels in hand. Despite having a 4-inch screen, it doesn't seem much bigger than the Galaxy S or even an iPhone 3GS. It's only if you put these devices back-to-back when it becomes apparent the Focus 2 is larger. We've got a nifty chart that goes over the key specs of the Focus 2 below, compared to the Titan II and Lumia 900 for perspective. It's getting tiresome to note that a new Windows Phone performs about the same as the others on the software front, but that's exactly the case here. Given the hardware restrictions that will remain in place until Windows Phone 8 hits, you're left with a 1.4GHz single-core CPU, an Adreno 205 GPU and 512MB of RAM to run your phone. As such, there are no surprises here, with the device averaging a WP Bench score of 87.2 after ten runs -- predictably not far behind every other Windows Phone we've used. Performance is usually smooth, but it's not ultra-zippy like the latest iPhone and top tier of Android flagships. It's not likely to be an issue as long as you're not an extreme power user -- heck, at least three Engadget editors manage to use Mango devices as their daily drivers, so we really mean it when we say "extreme." Apps generally load fairly quickly, but we occasionally experienced load-screen hangups while trying to access basics like Messages and Twitter. Aside from that and some mild stuttering when swiping around, we'd be hard-pressed to say any of the Windows Phone flagships perform materially better. The main concern we have with the Focus 2 rests with its 8GB (6.51GB user-accessible) of non-expandable storage. Despite having powerful connectivity, it leaves us to think that Samsung is forcibly positioning an otherwise solid device into the newbie smartphone owner territory -- that, or it's hoping you love SkyDrive. Of course, running over HSPA+ and LTE can do a number on your battery life, so how does it fare here? Using a Lumia 900 alongside the Focus 2, we really didn't find much of a difference between their running times. As long as you're not tethering over LTE and HSPA+ for about three hours a day like we do, you'll easily be able to eke out more than a day's worth of life -- so long as Mango's battery saver is turned on. Even adding in a light amount of Netflix streaming, a handful of calls, texting, a few camera shots and light browsing, we could probably make it through a normal workday without an outlet. That said, the Focus 2 managed to last 18 minutes longer than the Lumia 900's four hours and 29 minutes in WP Bench's CPU-intensive battery rundown. It's not a whopping achievement by any means, but if battery life is your main concern for a Windows Phone then look no further. 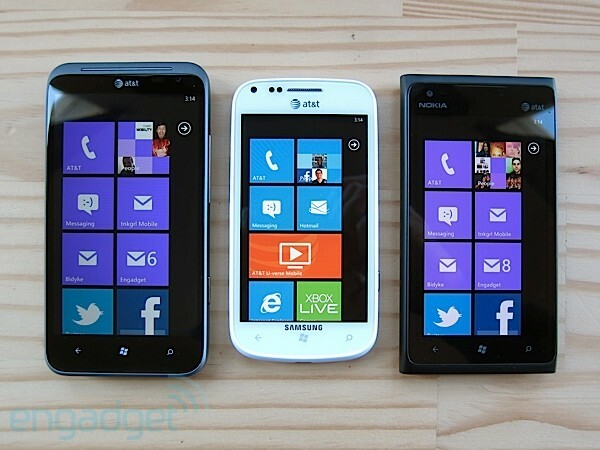 If battery life is your main concern for a Windows Phone then look no further. Speaking of radio signals, let's talk about speeds. Using BandWidth, we were able to record LTE throughput as high as about 10Mbps down (with peaks up to 13) and 5Mbps up in San Francisco. Tethering to a laptop in Midtown Manhattan, the best we managed was around 5 Mbps down and 4 Mbps up according to SpeedTest.net. Considering we've seen upwards of 21 Mbps down on the Lumia 900 and Titan II, we're disappointed that, in our LTE trials, the phone couldn't make it out of the speed zone that's common for HSPA+. Web browsing in IE9 is usually just peppy enough, but as our most accurate SunSpider score shows (7,058ms +/- 0.3 percent), it's a bit slower than the rest of the pack. We experienced load times in excess of a minute to fully load pages over WiFi with the Lumia 900, and the results aren't any better here. You won't catch any checkerboarding, but scroll down a long webpage and you'll be greeted by a sea of white for a second or two. Lackluster speeds aside, we came away quite impressed with the audio quality on the Focus 2. 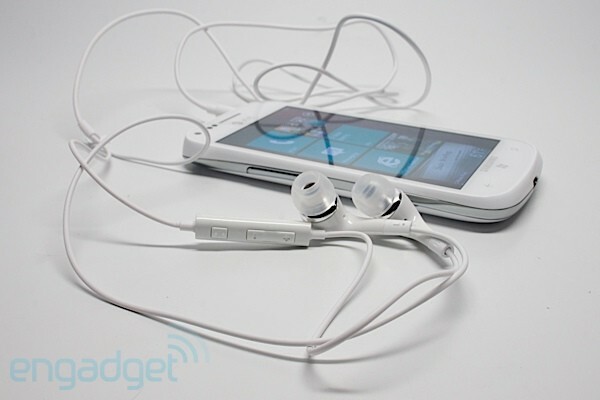 Compared to the Lumia 900, the device has much less hiss in the signal and a bit less grit to overall sound, with headphones plugged in. Although WP7.5 still can't seamlessly transition between two tracks without a quick pause, we didn't experience any popping like we do with the 900. Unluckily enough for Nokia's flagship, it doesn't stop there -- the Focus 2's earpiece produced clearer audio, without the slightest hints of metallic tones like the Lumia produces. Even the speakerphone sounds clearer, making the 900's sound a bit muddier and condensed in comparison (it's sound is noticeably thicker, however). Interestingly enough, the Focus 2 also has a hotter volume output (at least in the lower volume settings) through its headphone jack, needing only to hit 3 or 4 out of 30 when the Lumia needed to be near 15 to achieve the same output. With both devices, though, callers on the other end didn't have any complaints about hearing us. 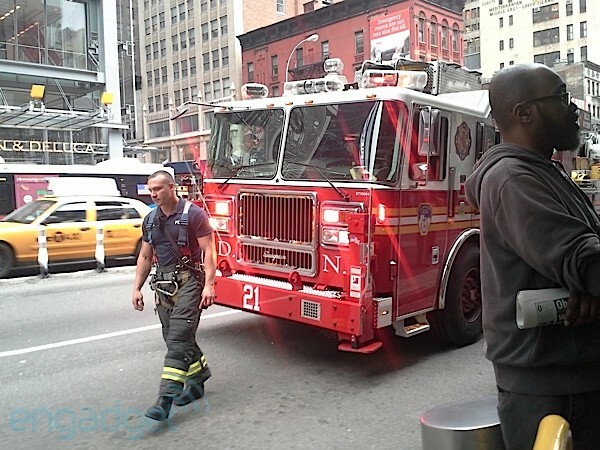 The Lumia 900 is certainly a good performer in the voice quality department, but there's no question that Samsung's lower-tiered device comes out a step ahead. And in case you're wondering, the included in-ear headphones are essentially (save for the inline remote and mic) what you'd get with a Galaxy Player: passable at best. Let's start this section by stating that, no, this 5-megapixel shooter won't rival your Canon S95s. 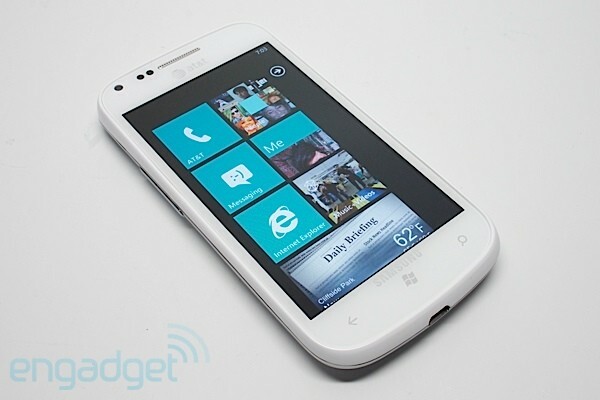 It does have some redeeming qualities, however, especially when pit it against the Lumia 900. Once you get into the Focus 2's live screen, the 900's look awful by comparison -- the framerate is smoother while panning, and the dreaded pink center that other WP7.5 devices suffer from is at least less obvious. The Lumia 900 does produce sharper images with more information and a wider angle thanks to its 8-megapixel sensor and 28mm lens, but the Focus 2 never slipped up with auto white balance like the 900 does on nearly every shot. Its contrast levels are a bit over the top on auto and highlights tended to get blown out easily, but you can always adjust your settings thanks to Windows Phone's plethora of manual options. Low-light performance from the Focus is acceptable.The images produced are noticeably less noisy than the Lumia, but the shots do come out a bit darker. The lens also suffers from some extreme flare-ups when any bright lights from cars and the like are introduced, so don't bet on anything other than artsy results in those types of situations. We were able to achieve better bokeh from the macro mode on the Focus 2 than the 900, but it had had a tendency to focus on the background in challenging light situations. The time it'll take to catch focus with both devices is about the same: not particularly quick. You'd be better off just whipping out a standalone camera if you're hoping to catch moving subjects, as you're results will always have a bit of blur. You'll also find a 4x digital zoom, but we'd steer clear of it as the results are worse than the VGA front-facing camera. Speaking of that, it'll do okay for videocalls. Pictures? Spare yourself the grief and don't even go for it. Overall, the cameras onboard are just good enough and the Lumia's results are largely better -- even if it means some extra tweaking to make it happen. Let's talk about moving images now. That rear shooter is also capable enough to capture VGA and 720p HD video (30fps). Video quality, like the photos, is just good enough to get the job done. Colors come through naturally, but you'll also be dealing with a fair amount of rolling shutter, lens-flaring, blown-out highs and wobbling from the slightest movements (there's no image stabilization to speak of). Far as we can tell you're also stuck with a fixed focus, but thankfully, exposure is continuously adjusted automatically. The audio results for video, unlike the rest of of the phone, comes out as compressed garbage to be blunt. As you can hear in our sample video, our blabbering easily clips the signal as it tries to compensate for the traffic whizzing by. You'll also notice that the birds chirping sound more like harsh squeals, and that the overall sound is tinny. The most annoying aspect we dealt with is that video defaults to VGA, meaning you'll likely miss many quickly-passing moving if you want to shoot in HD. Remember Windows Phone 7.5 Mango? Yeah, it's exactly the same Metro-styled UI with Live Tiles and sparse customizability options you either love, hate or have learned to live with. Samsung and AT&T have added their usual array of bloatware apps, but you can delete all of them to free up more of that spare storage space. On the AT&T front, there's U-Verse Mobile, Family Map, Navigator, YPmobile and surprisingly useful Code Scanner, while Samsung packs in its usual Now news and weather aggregator and Photo Studio editor. Unlike most crapware we actually found ourselves using these two Samsung additions a great deal -- the Now application easily trumps Redmond's baked-in weather app. You'll also find these and other exclusive bits in the AT&T Featured and Samsung Zone sections within the Marketplace, leaving us to again wonder why they have to come pre-loaded on the device in the first place. Notably, Samsung's free Photogram app gave us access to some nifty filters like HDR and Glow, which gives you more options in addition to the likes of Lomoshot and Dreamshot found in Photo Studio. We'd be remiss not to mention that Photo Studio also enables other goodies like a Panorama mode. We're really at a toss-up with the Samsung Focus 2. We find ourselves reluctant to fall in love with the current crop of devices as the next version of Windows Phone looms ever closer, but geez does the Focus 2 tug on our geeky heartstrings. When it comes down to it, we feel like Samsung is playing love games with us on this one. You've now got a $50 option for an LTE-capable Windows Phone that can outlive the batteries of the $100 Lumia 900 and $200 Titan II and outperform at least one on audio quality, marred by a PenTile display, a paltry 6.51GB of user-accessible and non-expandable storage, and slow LTE speeds. Furthermore, the overall package doesn't serve as a compelling upgrade from even the earlier Focus models unless your heart is set on LTE and tethering. 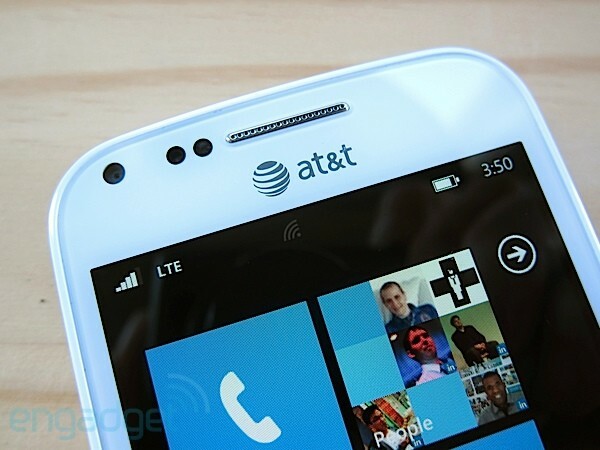 Every day that we get closer to Apollo it gets harder to recommend the likes of the Lumia 900 and the HTC Titan II on AT&T's network, making the lower-tiered Focus 2 an even harder sell. There's no question that the Focus 2 is a solid little handset, but we also have no doubt that when faced with a two-year agreement the Lumia 900 is still the best bang for your buck if you can pony up the extra $50.